Actually, there were far more than 8 translators. See here. 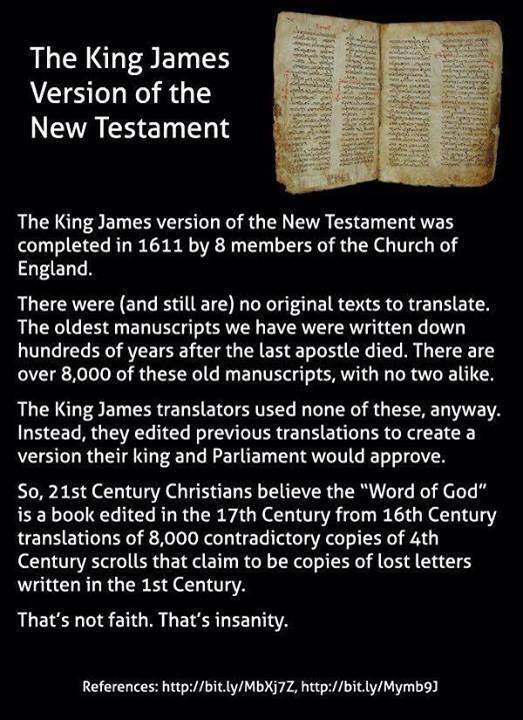 Also, there are in fact quite a number of extant manuscript fragments and quotations from early Christian writers of the gospels and Paul’s letters dating to the late first and early-mid second centuries CE, so the bit about the oldest manuscripts not being written down until hundreds of years after the last apostle died simply isn’t true. Also, “written down” suggests that the texts weren’t composed until hundreds of years after, which obviously can’t be so given the existence of the aforementioned first-second century fragments and quotations. “Copied” would have been a better word choice. Also, I should point out that we don’t have the original text of any other ancient writing (except, of course, for texts that would be classified as ephemera: contracts, bills, receipts, personal letters, etc.). Not one. So the Bible is not at all unusual in this regard. And some important ancient texts are extant today in only one or a very few manuscripts manufactured (hand made) in late medieval times (some right up until the invention of the printing press in Western Europe in the 15th century!). And the vast majority of differences among the New Testament’s 8,000 manuscripts are merely spelling and vocabulary choices (some of them mistakes, some deliberate, only a handful of them really impacting or altering the meaning of a sentence). Even in the age of computers, various printings of a text may vary in substantially these same ways. Finally, although the King James translators did rely heavily on previous translations of the Bible into English for their wording, these were meticulously checked against manuscripts in the original Greek (for the New Testament) and the original Hebrew and Aramaic (for the Old Testament), using a continuously and carefully maintained manuscript (hand-copying) tradition going back to at least the third century CE (and the Old Testament Hebrew/Aramaic manuscripts they used were maintained mainly in the context of Jewish, not Christian, transmission). Consequently, the last two paragraphs of this meme are simply utter nonsense.